On October 24, 2016, AARP sued the EEOC regarding the final wellness program regulations issued by the EEOC earlier this year. While the final wellness program regulations have received criticism, this is the first major lawsuit filed against them. AARP claims that the final regulations violate laws aimed at protecting the privacy of employee medical information. AARP is seeking a preliminary injunction to stop implementation of the final wellness program regulations, which are set to take effect in 2017. Under federal law, employers generally cannot require their employees to share medical information. Motivated in part by new HIPAA rules under the Affordable Care Act, many employers have started offering health assessments and other wellness programs that involve the sharing of employee medical information. The final wellness program regulations allow these types of programs so long as they are voluntary and meet certain other requirements. If the incentive under a wellness program is significant enough, it may be deemed essentially a requirement to share medical information. Under the final wellness program regulations issued by the EEOC, if the incentives under a voluntary wellness program do not exceed 30% of the cost of health insurance coverage, the program will not be deemed to require employees to share medical information. We will continue monitoring this lawsuit and provide updates when they are available. 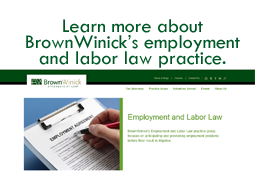 If you have any questions about your wellness program, we would encourage you to contact any member of the BrownWinick employmentpractice group.